I am no longer writing a book. The Lean Startup Book is done. Finally, really, truly, done. On July 4, I celebrated Independence Day by making my very last revisions to the paper (!) page proofs, and mailing (!) them back to my publisher. (Yes, I also sent them a scanned PDF via Dropbox.) The finished book will come out on September 13, featuring an amazing cover designed by my IMVU co-founder Marcus Gosling and refined and tested by so many of you. I am incredibly proud of the result. 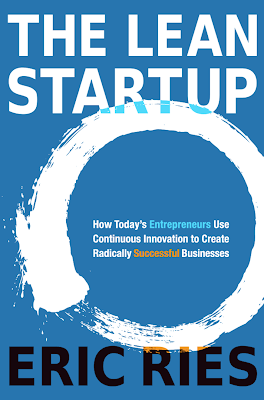 If you've been waiting for a comprehensive account of the Lean Startup and how it can help you achieve dramatically better business results, this is it. The book contains tons of case studies. Some are from famous companies that you've heard of, like Dropbox or Groupon. Some are from obscure startups who you haven't heard of -- yet. And others are from unusual folks we don't normally think of as entrepreneurs, from corporate managers to government agencies. But the book is much more than just stories. What I am most proud of is what I hope will be a significant contribution to our collective conversation about entrepreneurship. What really constitutes product/market fit? I believe it is time to put that concept on a quantitative footing, so we can move past the unhelpful, "if you are asking, you don't have it." Can you tell the difference between being just on the cusp of greatness and being helplessly far away? I believe we can. What is entrepreneurship, really? I believe entrepreneurship is the management discipline that deals with the domain of extreme uncertainty. Anyone who is trying to innovate without knowing what's going to happen is an entrepreneur, their venture is a startup. Most of our management tools, like planning and forecasting, require a long and stable operating history. Does anyone feel like our world is getting more and more stable every day? How do you know when to pivot and when to persevere? Readers of this blog know that entrepreneurship is rife with failure, and a big part of the Lean Startup method is to pivot rather than stubbornly launch and hope for the best. But how do you know when to pivot? We all know companies that seemed to pull out a win just when all hope seemed lost. How do you know if that's you? If you've read this far, I'm guessing you're at least a little bit interested in the book. If so, I'd like to make one specific ask. Would you help me out by pre-ordering the book right now? It's available for pre-order from many retailers, including Amazon.com, and you won't be charged until the book comes out September 13, 2011. So it's more like a reservation. The entire traditional publishing world is driven by pre-orders, so if you are willing to take a moment and pre-order, you'd really be helping me. A few months ago in Austin during SXSW, Andres Glusman (of Meetup.com) arranged a very special meetup. We got together all of the Lean Startup meetup organizers that were in town for SXSW. It was an amazing experience. All of them are busy taking this idea and transforming it into a movement. They are experimenting and innovating and sharing their results. I felt privileged to be there. One of the questions that kept coming up at that meetup -and at countless events since- was why I decided to go the traditional publishing route for my new book. It’s a fair question: the publishing industry is slow-moving, frustrating to navigate, and technologically backwards. They are remarkably un-lean in the way that they work. Most books are still published on a waterfall-style schedule, with massive amounts of work-in-progress inventory building up at each step. Customer data is rarely used to make decisions. At the same time, self-publishing options are getting better every day. I already reach thousands of entrepreneurs through this blog, my Leanpub-powered ebooks, and even printed versions created via print-on-demand at Lulu. Not to mention the megaphone at my disposal through Twitter, conferences, etc. I think it is safe to say that if anyone out there is seeking out new ideas about entrepreneurship, they will eventually find their way here. I spent over a year researching my publishing options, digging into the structure of the publishing industry, and really trying to understand what its strengths and weaknesses are. But what surprised me most about that search was that I learned as much about myself as I did about publishing. Media businesses are amplifiers – of people, of ideas, of (too often) total BS. The real question when engaging with them is – what do you want to amplify and why? I’ve written and spoken often about my desire to see the Lean Startup movement change the world by stopping the obscene wastes of people’s time: from products that fail, from marketing initiatives that have no impact, from IT projects that are doomed from the start, and, of course, startups that are building something nobody wants. When I had to decide what to publish, I asked myself this question: who is causing most of that waste and how to we reach them? When you put it that way, I think the answer is pretty clear: there are countless managers, investors, and business owners out there, doing the best they can, using outdated and obsolete tools to try and create and launch new cool stuff. Unfortunately, most of those people are not reading blogs about entrepreneurship. In fact, a large number of them do not even consider themselves entrepreneurs, or think that they have an entrepreneurship problem. I’ve written about this before, in the context of why it’s important to teach MBA’s about entrepreneurship. Consider the total amount of funding for doomed projects that comes from VC’s, large company M&A departments, government grants, and private equity firms. How much of that investment is squandered because the funder is relying on vanity metrics for evaluation? This is the kind of person who badly needs a new paradigm for understanding entrepreneurship. She works every day financing the next generation of startups. And because she works with outdated tools, much of her money - not mention the time of thousands of people that money hires - is being wasted. In the Lean Startup movement, we know how to fix these problems. We know how to shift attention from vanity metrics to actionable metrics, using “innovation accounting” to measure real progress. If you’re reading this blog, that means that you are a classic early adopter – and I thank you. But the people we need to reach next are classic mainstream customers. They are not looking for new ideas about entrepreneurship, they are too busy trying to get their work done. I believe this is the function of traditionally published books these days: to help bring new ideas to a mainstream audience, even when they aren’t looking for them. So that’s why I decided to publish a traditional book this fall. And that’s also why I’ve been so focused on coming up with reasons why you should pre-order the book before then. You see, the thing about mainstream customers is that, most of the time, they only want to read books that everyone else is reading. That’s why bestseller lists (and app stores) are so effective. They set up an information cascade that helps mainstream customers decide what to buy. Which brings me back to the meetup-of-meetup organizers. I felt a little sheepish telling them this same story. It's self-serving. Although I truly believe this book is about you and the work you are doing to change the world -- for better or worse -- it's my name on the cover. But at that meetup, the organizers only wanted to know: how can we help? who do we need to tell? how many copies do you need to sell? They are the ones who encouraged me to write this post, and speak directly about why this is important to me. And that’s where you come in. All mainstream books are officially released on a Tuesday. Why? Because the bestseller lists are calculated on a weekly basis, and they all run Tuesday-Tuesday (a few run on a monthly cycle, but with the same effect). Thus, to have your book debut as a bestseller requires that you sell more copies in that first week than the other existing bestsellers. Luckily, pre-orders (no matter how early) count as sales towards that first week's total. So that is what I'm asking you to help make happen. We have a chance to take this set of ideas truly to the mainstream, to have them take us seriously in a way they never have before and - in the process - to redeem a lot of people's hard work, talent, and energy. Amazon keeps a sales rank for the book, which has been bouncing around quite a bit. Right now, we're at just about #12,385 [not anymore, see update below]. Will you take a moment and help drive that number down? As always, your enthusiasm and support mean the world to me. Thank you. Unbelievable - Amazon rank #7 in books overall, in just a few hours. Thank you all so much. 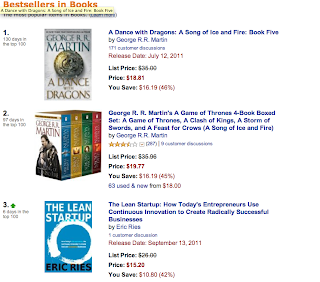 [Update 7:21 AM] #3 behind George R. R. Martin.